개발자 : Cityredbird Location Services Ltd.
Record waste, track reasons for wastage, and update Inventory to reflect ingredient wastage. Fillet is the app for chefs. It takes the pain out of recipe costing, saves time spent on counting inventory, and prevents mistakes when ordering ingredients. Trusted by thousands of restaurants, cafés, bakeries, confectioners, food trucks, and caterers around the world! “[…] brilliant app for chefs/caterers […]” - Philip L.
“[…] such a useful product!” - Cherif H.
“[…] great features.” - Jeanne A. “[…] great app […]” - Kevin B. "[…] this is a great app. Very useful as a first-hand tool.” - Marco M.
"I love the app. 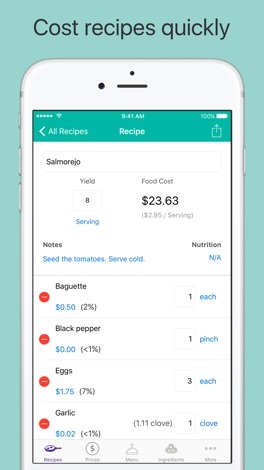 So far so good.” - John V.
• Calculate food cost and nutrition for recipes and menu items. • Enter ingredient prices for multiple purveyors. • Set a preferred purveyor and price for each recipe ingredient. • Use your own units of measurement (e.g. each, bunch). • Specify density and edible portion for ingredients. • Calculate Gross Profit Margin including variable costs and fixed costs. 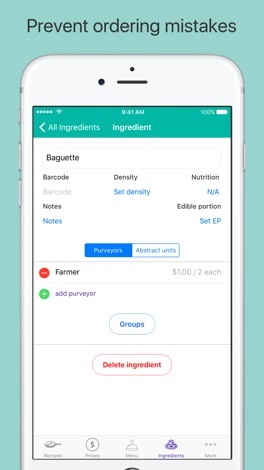 • Categorize your ingredients into groups to add them to recipes faster. • Reference the USDA National Nutrient Database (available offline). • Plan your menu specials using the Menu Specials Planner. • Duplicate recipes and menu items to save time. 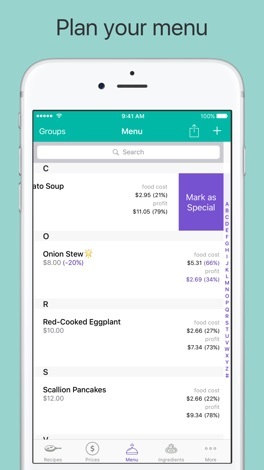 • View prices for ingredients while adding them to the recipe. • Omit some recipe ingredients from recipe cost. Swipe left on the recipe ingredient to reveal buttons to omit and delete the recipe ingredient. • Track your inventory in any number of locations. • Scan barcodes to quickly add new ingredients and look up existing ones. • Export inventory reports and mail them. 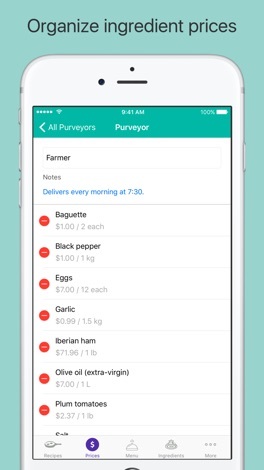 • Generate ingredient purchase orders organized by purveyor. • Export purchase orders in PDF and CSV. • Access your data from any computer by going to getfillet.com! • Backup and synchronize your data across multiple iOS devices. 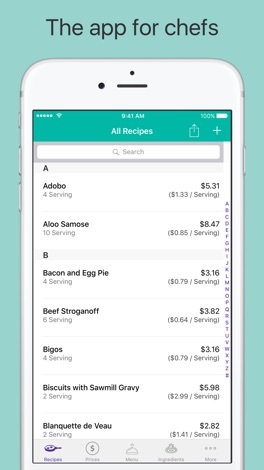 • Import prices and recipes from spreadsheets. • Works offline and doesn't require registration. • Universal app compatible with both iPhone and iPad. • Comes with a support forum, knowledge base, and video tutorials. Please feel free to contact us with any questions. We love to hear from you and are always happy to help: team@getfillet.com. Download and start using Fillet in your kitchen today! SketchTo - Sketch & Share Your Ideas, Quickly! - Ask a question, get an answer! ...from Magic Answers! - See the whole world of #MagicAnswers from Twitter - Share your answers with the world on Twitter, Facebook, Instagram, your friends, and more!